GREENGUARD for Children & SchoolsSM product certification programs. Featuring Advanced Particle Technology™. Regal Pearl Finish paint is a premium quality proprietary 100% acrylic enamel with unique properties. 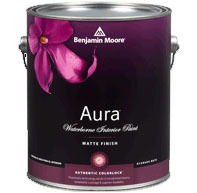 Its high-hiding pearl lustre finish provides an elegant look to walls, ceilings, trim, doors, and cabinets. 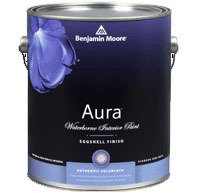 Regal Pearl Finish paint is easy-to-use, spatter resistant, fast drying and has no unpleasant odor during application. Featuring Advanced Particle Technology™. 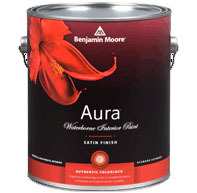 A premium quality 100% acrylic flat enamel featuring excellent stain resistance. It contains microscopic ceramic beads and proprietary stain release technology that together create a protective surface that resists the absorption of stains. Most common household stains can be easily removed with mild soap and water. Featuring Advanced Particle Technology™. 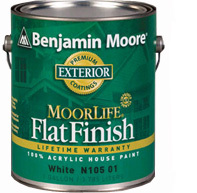 A premium quality 100% acrylic paint that combines the decorative beauty of an eggshell finish with exceptional durability. Featuring Advanced Particle Technology™. A premium quality, proprietary 100% acrylic coating in a flat finish coupled with a low spatter formula that minimizes roller “overspray.” It features easy application with no unpleasant paint odor, fast dry, and soap and water cleanup. 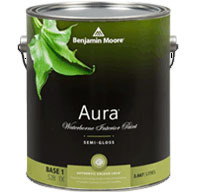 A premium quality, 100% acrylic exterior latex house paint in a popular low lustre finish. Our latest technological improvement, using 100% acrylic resin and proprietary alkyd technology, provides a protective exterior coating that will remain looking freshly painted years after the job is finished. 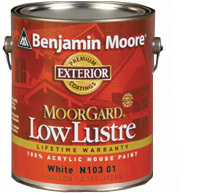 A premium quality, 100% acrylic exterior latex house paint in a popular soft gloss finish. 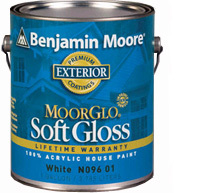 The unique resin package in the MoorGlo® 100% Acrylic House & Trim Paint provides optimal adhesion, gloss, and color retention along with long lasting durability. 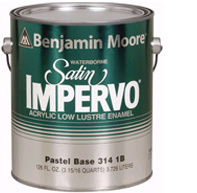 A premium quality 100% acrylic latex enamel that delivers the desired flow and leveling characteristics of an alkyd based paint. It provides a tough, high hiding low lustre finish that stands up to repeated washing and scrubbing. 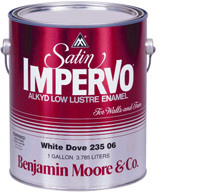 Waterborne Satin Impervo Enamel (314) will not yellow like conventional alkyd enamels. It is easy to apply, resists spattering, dries fast and cleans up with soap and water. Be sure to visit Benjamin Moore’s Personal Color Viewer to upload photos and see how colors would work in your room without having to paint!